In my earlier posts I mentioned, that I like matching my cards to the recipient. This particular card was made for my grandmother’s 96th birthday, she’s a pretty cool lady who solves crosswords and sudoku on a daily basis, so I wanted something quite sweet and not old-fashioned. This is what I’ve come up with. I like getting the most of my stamps, that’s why whenever I get an opportunity, I reuse the same images and change the colour scheme. It is always fun to see how different a project can look when different colours are used. Last time I used this stamp, I chose cold turquoise and pink shades, so this time I went the completely opposite way. The colour scheme was really dictated by the little bee, I wanted to use a lot of yellow - so I did! I picked some patterns which complemented each other from the “Wanderlust” collection by First Edition, decided on the card layout and matted my papers on pearlescent soft gold cardstock by Craft Sensations. I then layered them to achieve the maximum impact of each pattern. 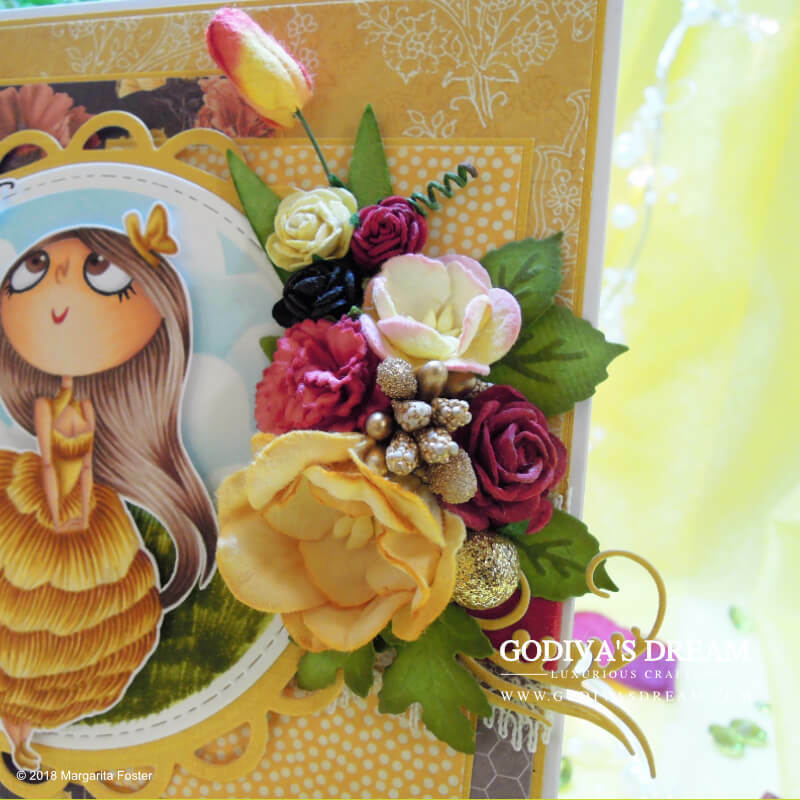 For the focal point of this card I chose the lovely “Peony” and her bee friend by the Kraftin’ Kimmie Stamps. I coloured the images using Promarker/Brushmarker and Copic markers. Instead of using traditional black ink to stamp the image, I used sandy beige (Memento “Desert Sand”). This was a new type of colouring experience for me as I tried the “no line” approach for the first time ever! I found it incredibly satisfying as I didn’t feel restricted by black outlines any more. A lot of people seem to find this technique daunting, but I really like it, it’s definitely fun, try it, if you haven’t yet! Once I coloured the stamps, I fussy cut them leaving a narrow white outline around them. I find this helps the images stand out better against the backgrounds. To showcase Peony and her bee friend, I chose Spellbinders “Lacey Circles” (S4-293) die. I cut the shape out of the same pearlescent gold cardstock I used to matt my patterned papers. I also die cut out a stitched edge circle in the size which would comfortably fit in the middle of the lacy circle. Instead of displaying the stamped image on a coloured background I’d normally go for, I decided to create a meadow scene. I stencilled some cloud patterns using Tim Holtz “Distress Ink” in Tumbled Glass and used Crushed Olive to create the green background, then used Shabby Shutters as watercolour to draw some grass stalks with a paintbrush. Finally, I glued the circle with the meadow scene to the gold lacy one and adhered the fussy cut stamps in the middle using 3D foam to add depth and dimension. The colour scheme of the card, and the fact that I used a stamp named after a flower, just called for some floral embellishments. I chose mulberry blooms in colours that complemented the papers. I made sure to pick a variety of sizes and types of flowers for extra interest, I also added some glittery golden stamens and a berry. The leaves were die cut using Spellbinders “Create a Rose” (S2-067) and “Create a Daisy” (S2-062). In order to contrast the yellows, I added a nice lipstick-red satin ribbon and a double bow (no news there!). The gem in the middle of the bow reminded me of sugar crystals which looked just perfect for this honey coloured card. You can also see some ivory lace peeking out from under the ribbon, which adds some extra elegance to the card. Do you ever re-use your stamps or prefer to only use them once? What are your favourite colours to craft with? Don’t be a stranger, leave a comment and thank you for reading.